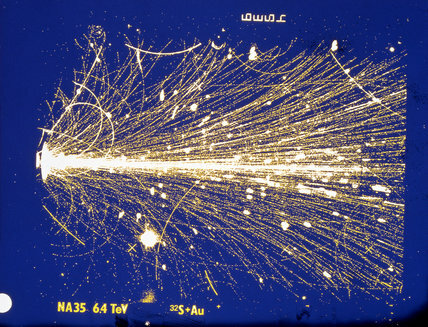 Sulphur ion striking a nucleus in a gold target, CERN, 1990s. A sulphur ion at 6400 GeV strikes a nucleus in a gold target. The resultant particle shower is recorded in a streamer chamber. Detectors are used to measure properties of particles. Some measure the tracks left behind by particles and others measure energy. Founded in 1954, CERN is the world's leading particle physics research laboratory, and one of Europe's first joint ventures.